Since the dawn of time, before the discovery of fire or the invention of the wheel, mankind has struggled with one big question…THE question. And that question is — “Where should I store my pajamas during the day?” If you are lacking pajama storage ideas, fear not! After millennia, I shall bring mankind out of the darkness and into the light and FINALLY solve the question that has plagued mankind for eternity: where to hide pajamas during the day. Where should you put your pajamas during the day? Have you ever wondered what other people do? I have! I went to Professor Google to ask but came away with unsatisfactory answers to what kind of pajama holders people use to store their pajamas during the day. I swore to myself that someday if I started a blog, I was going to address this topic — to bring this issue into the light. On my heroic quest to find enlightenment, I encountered many misguided souls along the way: mothers, sisters, daughters, even strapping men. All have asked the question; none have received the true answer. Here are some of the (unacceptable) places that people are hiding their pajamas. None of the above — just sleep naked! As you can see, this is a HUGE problem — I mean, we even have people sleeping naked or laundering their clothing every night for lack of a better answer. Clearly, they are dealing with the issue via escapism. Oh! You poor wandering soul — finally you can lay down your weary sloth onesie in relief. This basket is the solution to all of your pajama woes! 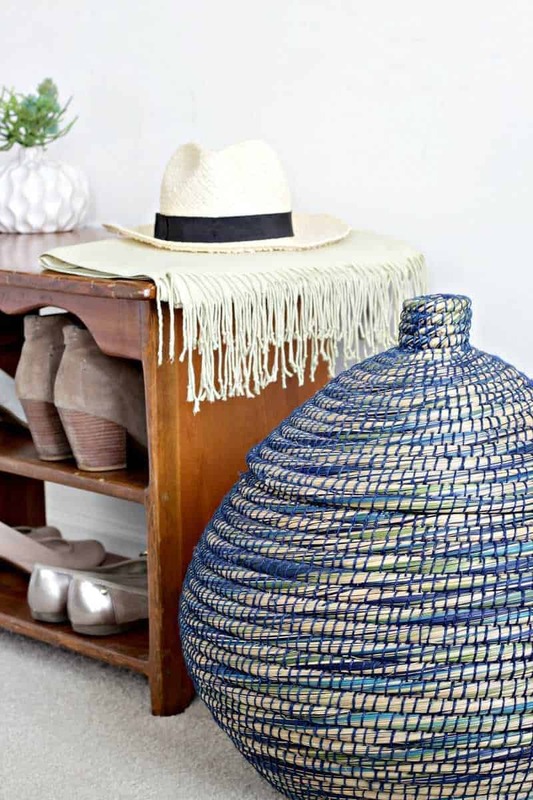 This blue Bogra basket was woven in Bangladesh and sourced through Fair Trade. It’s 100% handmade from kaisa grass, woven in stunning blues, greens, and neutrals. Best of all, it solves your biggest problem. Finally, an answer to the greatest mystery of the universe. The basket is actually a lot larger than you might think (20 inches in diameter and 18 inches tall). That means it has ample room to hold the pajamas of a family of four, with maybe space for a stuffed animal or two to spare! Here is a shot of how our pajamas actually fit into the basket (please note that I do not usually fold our PJs before stuffing them in; they were folded nicely for the sole purpose of this photoshoot). You don’t have to go with this basket, but do make sure to find a basket with a lid. Otherwise, your “dirty laundry” is quite literally on full display! For the size, quality, and beauty, the price is quite reasonable. 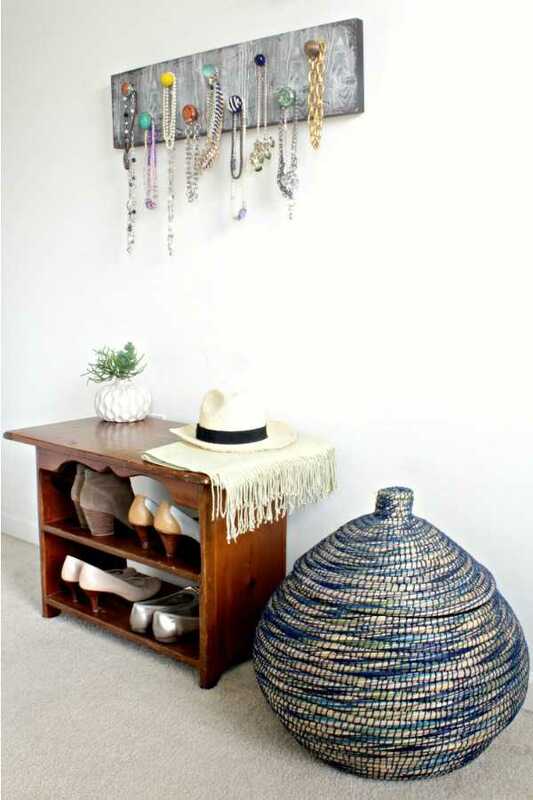 Compare it to the Pottery Barn Beachcomber Lidded Tulip Basket, which retails close to triple the price. 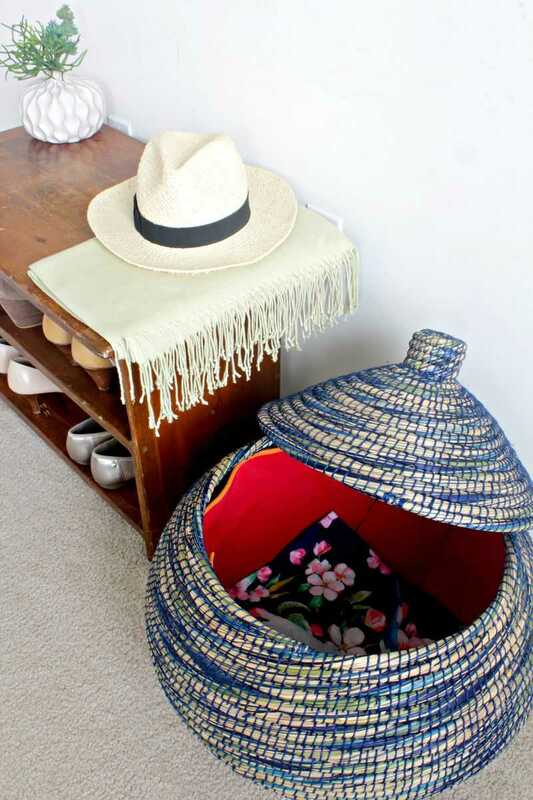 If you are looking for a good place to store your pajamas during the day, find a great lidded basket. Will you use a basket for your PJs from now on? I hope that this post was helpful and made you smile. 🙂 I had a lot of fun writing it! If you like my idea of using a basket to store your PJs but feel a little squeamish about putting your clothes directly into the basket, let me know if you would like my no-sew tip for creating basket liners in less than five minutes! Of course this made me smile! This is actually a cool tip, and I love your humor in sharing it with us! Hugs! This is so smart! I’m totally one of the “store them on the bed” people. Not pretty. This is so much smarter, not to mention, gorgeous. Thanks for the awesome new idea! Thanks Marie, I definitely had my “troll face” on when I was writing this one 😉 The basket is truly gorgeous…and the lid also makes an awesome hat if you happen to be a toddler. #protip. Cute idea. I just store mine on a hook on the linen closet door in the master bathroom. Not too creative, I guess! That seems like a surprisingly common way! Hahaha, that’s funny! Well, you have been sick…hope you are feeling better! Great idea. Thanks for sharing at the To Grandma’s House We Go DIY, Crafts, Recipes and More link party. I pinned this. Hope to see you again next week. I love this! Great idea. When I was a kid I had a “pajama pig”- a stuffed pig with a PJ pocket in the back to keep them in. But this is a good solution for grown-ups. Pajama pig sounds ADORABLE! I agree this is a great solution for big kids (I might still want a pajama pig though). 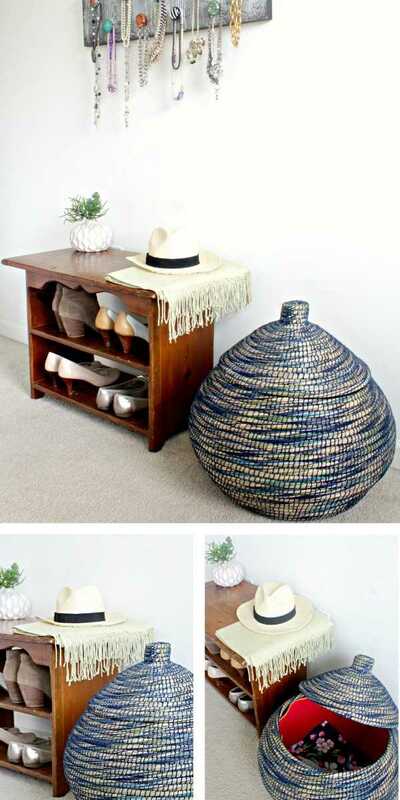 Love this idea, now if I can get my husband to use something like this instead of throwing it all on the chair that would be great. Thanks for sharing on To Grandma’s House We Go!